Before you reach exotic destinations in real life, you can explore them with the help of virtual reality apps. The desire to travel to new places has been in our DNA from the most ancient times. Human curiosity needs to be satisfied by experiencing new sceneries, new cultures, and new activities. However, few of us can afford to travel to every continent and every country on Earth. Now, new technologies have made travel and discovery affordable to all of us, without us having to leave our homes. We are talking, of course, about virtual reality apps that have mapped and put together 360-degree scenic landscapes, popular museums and various other tourist attractions. As always, we are here to help you enjoy the best experiences in VR. We have tested some of the most popular virtual reality apps for travel and discovery and selected the ones that offer the best immersive experiences. Our picks feature both natural landscapes and man made tourist attractions. We did not stop here, on planet Earth, but tested VR apps which explore the space around us and the planets in our Solar System. You may have explored our planet, in the past, by installing the Google Earth software for computers, or by using the browser interface. This was a detached experience, and you were well aware of being in your living room, looking at a screen. Google Earth VR will make you believe that you are actually exploring various landmarks, like the Great Wall of China, the Colosseum in Rome, or the busy streets of Rio de Janeiro. This is one of the most complete virtual reality apps for travel, in terms of available destinations to explore. You can download Google Earth VR for Oculus here. e rich flora and fauna, or traditions of remote cultures still living in communion with nature. Some of the most popular content created by the Discovery Network is now available in VR. 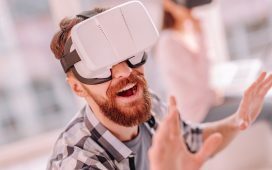 The network has not yet established itself in a ruling position in terms of virtual reality apps for travel and discovery, but we are certain that it will add more immersive experiences in the near future. Discovery VR is available for free on Google Play and iTunes. The mission statement of NASA is: “We reach for new heights and reveal the unknown for the benefit of humankind.” Looking at the variety of content available to every human being who is curious about what is out there, beyond our planet, the organization is keeping its promise. Its Android and iOS apps feature 360-degree images from the Solar System exploration missions, from the International Space Station and from Mars. The Curiosity Mars Rover has relayed detailed images of the red planet, allowing the specialists down on Earth to create 3D videos and immersive images that will virtually take you where no man has set foot before. This is not specifically a virtual reality app for travel, but it promotes incredibly detailed and high quality videos of the most popular exotic destinations and landmarks, such as Machu Picchu, Nepal and Jerusalem, among other VR experiences. With Jaunt VR, you can become immersed in mystic, distant and amazing places which you may explore in reality one day. Until then, you can get the app for free on Google Play or iTunes. Do you want to visit popular travel destinations and discover their best hotels, museums, restaurants and natural beauties? YouVisit is one of the best virtual reality apps for travel to try. It features thousands of cities and natural landmarks and gives you a fully immersive experience of being in a place, and walking among its people down the street. If you plan to study abroad, YouVisit allows you to explore your future college campus, its dorms, and the local pubs and popular places where students gather after classes to relax and socialize. The app is free on Google Play and iTunes.